The softest of the LC HD Pads, allows you to apply waxes, sealants and all-in-one (AIO) products! Pair with your favorite wax, sealant, cleaner wax, AIO, etc. The Lake Country HDO Red Waxing Pad will provide you with an incredible finish when using waxes, sealants and all-in-one (AIO) products! This pad has an aggressive cell structure, but it is extremely soft in density, making it super soft and gentle. This allows you to apply your favorite wax or sealant to protect your paint, or a cleaner wax and AIO product for very light correction and protection! The HDO line of pads are perfectly balanced, cushioned, and feature thinner foam. This thinner foam reduces foam movement which will reduce heat (10% cooler) which can cause hazing and micro-marring while polishing. These pads are beveled at a 70 degree angle and this design prevents pad "rolling", allowing the pad to stay flat on the surface. The open cell cooling chamber in the center of the pad is another great feature of this pad as it helps keep the pad running at cooler temps, increasing durability and polishing results. The backing of these pads will also withstand the large throw of the Rupes, Griot's Boss and other high powered large throw machines. This pad comes in three great sizes and the 3.5" pads are perfect for 3" backing plates, 5.5" pads fit on 5" backing plates and the 6.5" pads fit great on 6" backing plates. 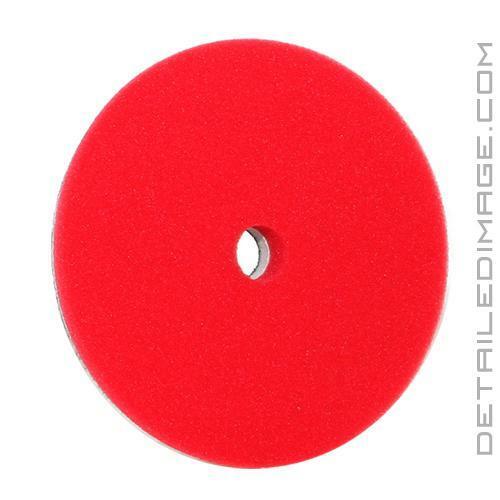 Pair this Red pad with your favorite wax, sealant, cleaner wax, AIO, etc. and protect your paint today!